Elkins project, I wanted to keep things simple. A major incentive came in the form of dismantling another modeler’s layout in a down-sizing move. He gave me his bench work, which actually started the thinking process on this model railroad. Elkins was already a focus, but having about half of the bench work ready to install prodded the design along. In addition to these parts, I also had four sectional pieces from a portable narrow gauge layout that never quite took off. Once an understanding of the bench work parameters was reached, then a crew came over and we starting fitting pieces together. The height seems to throw most visitors as not many people build a layout with the track 60 inches off the ground. This was done in order to have 54 inches of clearance below the layout. In order to maximize the plan, I felt duck-under locations were necessary. Several people have offered to build a drop section, but I realized this may compromise the stability of the layout. A 28 foot stretch goes from an anchor points at the back of the garage to an anchor point at the front of the garage. It’s not like many layouts where this length is attached to a wall and there is a doorway entry where the drop portion is needed. A chair on rollers has already been useful as an entry assist. The layout is long and linear and made of sectional parts to ease any possible move to a new location. 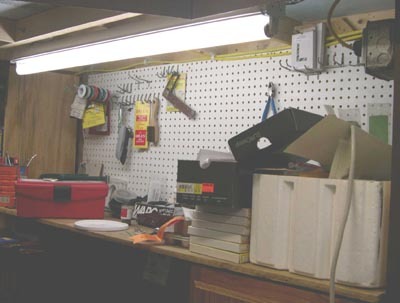 Shelving below the layout holds a small hobby shop of kits, parts, tools, and materials. Other items like a lawn mower and an old record collection also fit nicely under the layout. A workbench is conveniently located under the Coal & Iron wye. Construction began in the fall of 2005. The layout was open for the Mountain State Express regional NMRA convention in late April 2006. Bench work was completed and the backdrops were installed. Much of the foam was was painted and in place, as was some of the fascia. No track was in place for the visitors, but many were excited about the possibilities. Keep checking the progress reports as work continues.